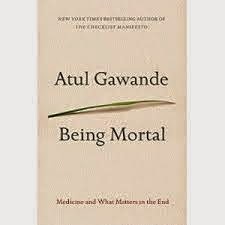 Atul Gawande is expanding the conversation about care at the end of life with his new book, Being Mortal. Will people take notice? As a doctor who recently finished training in internal medicine, I had many stories like his from my time in the hospital. I saw patients and families who would go to great lengths to try to extend their life in spite of an exceedingly poor prognosis. They continued to plea, “What else can we do?” and “What other therapies exist?“ Many aggressive treatment options were offered, despite the fact that it was unclear how much these interventions would extend their life, and many times they produced complications including pain, infections, and the inability to interact with their families. It seemed to me that we were doing something wrong. Perhaps we were answering their questions incorrectly. Or maybe we, as physicians, weren’t asking the right ones. • How did their loved one want to spend his final days? • What sorts of treatments were worth pain and suffering, and which interfered with things that were important to him? • If the patient knew he would die in one day, a week, a month or six months, how would he want to spend that time? Now that I am in my specialty training in Geriatrics, the care for older adults, I know that the culture has to change. We have to become better at these conversations. Not all decisions are weighted equally at the end of life. Some interventions offer no benefit and yet we use them, just to feel as if we are trying something. As a trainee, I am often nervous to not offer everything we have in our toolbox because I have learned from a scientifically-advanced medical culture that this is how we do things. How does a cultural shift happen? Perhaps, it just takes one person who people respect to speak up- maybe a physician, who specializes in cancer surgery, who had his own struggles with the way his father died. What if that person, who began speaking to us about this in The New Yorker years ago, was able to inspire a wider audience by being on The Daily Show with Jon Stewart, and writing one of this week’s most viewed articles on The New York Times website? Maybe, with Atul Gawande’s encouragement and his new book released today, we can begin to reframe our goals for dying and allow our patients to choose the way they live. I’ve downloaded his book today on my kindle, and I welcome your comments as you read along beside me. What is difficult for doctors is the resistance of families, who play out their own fears of death or regrets without acknowledging the needs and wishes of the dying family member. Very few older patients want to hold on to life as much as their families. Even the clearest instructions made by a patient can be overturned by family membera and it's hard for doctors to intervene. I agree with Anon. Also, the questions raised in this article do need to be addressed. I've seen so many dying patients hang on longer than they want to, because of family desires and anxiety about their impending deaths. We need to learn to let our loved ones go with dignity, their and our own. As individuals, we first need to personally decide how we want to exit life. After that,we have to communicate it effectively to all those who may be involved. And that takes time. No one will listen seriously when you first come out with it. They need to be convinced you have the capacity to take this decision. "I had no choice at entry; why can't I have one at exit, at least?" All it gets me is a laugh. Obviously, if I am capable of raising such a morbid issue I am not competent to decide for myself. My prediction: it will take years for this to be accepted as a legitimate concern for an individual. After that, it will take yet more years for the law to catch up on all the technicalities. And don't forget, the pain does not have to be physical only; which aspect is even farther out in subtlety. Q. Is it time to launch a loud discussion? A. Is it not overdue, already? Yes to all of the above AND as the pendulum swings toward more collaborative patient-centered care we must remain ever vigilant that frail elders and others with limited societal leverage be supported in their decisions. Even if that means accessing services and care that some may deem "unreasonable". Quality of life is relative. We will also need to support those who choose a more aggressive approach to the end of their lives. We don't want to find ourselves believing that by choosing more intensive care patients are demonstrating a lack of capacity to make that decision. I just want to add that it's not just about "famous" people telling it like it is. It's about each and every one of us standing up or sitting down with our patients,families, friends,and talking about death and dying as if it were a normal everyday occurrence, that will happen to all of us. It is. Once the conversations are normalized, the reasoning behind our choices will become easier to discuss. As an internist certified in palliative care, I find that the inappropriate aggressive care often is initiated by physicians and not at the families' insistence. When presented with the choice, patients and families often choose comfort over life prolongation. Unfortunately these conversations are not being had with patients. Hopefully this book and the palliative care movement will help these discussions to take place. Oh it is such a complicated stew of the patient, family and care options... including how much the various routes cost financially and in terms of what time and abilities the care givers have! How does one maintain quality of life when quantity is limited? How does one maintain a basic quality of life for the care givers as well? Being at home under Hospice care is a wonderful thing, but it comes with a very heavy responsibility to the family of the loved one. Knowing when the discontinue aggressive care is not always the bright line we'd like it to be. What constitutes "chance of recovery"? When does the patient reach the point of no return? How should the layperson recognize when this point has been reached and what does it take for them to understand what it means, especially when their emotions are involved? We chose to pull the plug when my father, age 84, unexpectedly went into multiple organ failure following a surgery he was expected to survive. There was family unanimity and no request for heroic measures. We all knew the score. It helped that Dad had an advance directive that was clear about his wishes. No one should underestimate, however, the difficulty of making this decision. It is an enormous moral responsibility for a family member to sign the DNR order, let alone to actively discontinue IVs, ventilator and everything else that is keeping your family member alive. Once you cross that chasm, your decision is irrevocable. It seems to me that what people need most is support and reassurance that it's OK to do this. Because, to us, it doesn't just feel like taking a life... it IS taking a life. Although I think it's appropriate to consider all the medical aspects of end-of-life decisions, I would guess the ethical and emotional dimensions weigh more heavily on families. As a former hospice chaplain, I second the comments by the chaplain Karen. The chaplain comes to patient and family without an agenda and typically has more time to devote to gaining a deep understanding of patient and family hopes, values, and difficulties. This is especially true when religious or spiritual values may underlie the reluctance to shift to comfort care. Chaplains can be of great help to the team by adding this dimension and providing ongoing support to patient and family through (sometimes) multiple iterations of the decision making process and then the dying process. I am dealing with a 94yr old mother who has Alzheimers. Thankfully, my sister and I are in agreement that certain measures will not be used. No feeding tubes. No out-of-hospital CPR. Our mother gave us Medical Power of Attorney while she was still mentally intact. For years, mother told me that she intended to be cremated. She never said a word about this to my sister, and there was nothing in writing. When we brought it up for clarification recently, mother had NO memory of having wanted cremation. So, in this family, there will be a casket burial. The more a person can put their wishes in writing, the better.